Today was the big day! Apple finally opened a store in Sweden. It’s located in the shopping mall in Täby. Ever since they came out with the location and date of opening we knew we were going to go there on the opening day. We had no plans of actually standing in line and going in to the store, we just wanted to take a look at the event. They opened the doors at 10am, and we arrived there around 10:15am. WOW what a line! I don’t even dare to guess how long it was… below photo just shows the line closest to the store. The Apple employees must have used up a lot of energy drinks today because they sure made sure people in the front was having fun! They were screaming/yelling, and at one point two of the even ran around the upper part of the mall giving high fives to everyone waiting in line and some onlookers. I don’t think Sweden has ever seen this much energy around a store opening before. I’m quite interested to go and see the opening of Sephora in October. I’m sure it will be much more low key. 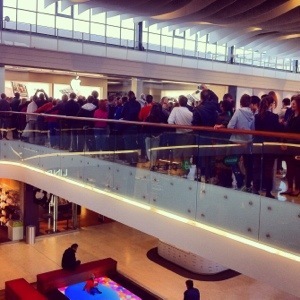 The Apple store opening reminded me of opening days at stores in the US with the fun and energy from the workers. Next time I’m back in Stockholm (3 weeks from now) I need to go there in order to check out the store. Not that I plan to buy anything but the Apple stores are always fun to visit.